IIASA teamed up with the Organisation for Economic Co-operation and Development (OECD) and the European Commission to test and play The World’s Future game–a social simulation game developed by IIASA researchers on the interconnected nature of the Sustainable Development Goals (SDGs). The game sessions provided valuable insights on SDG implementation, while also offering an excellent opportunity for people from different working units and sectors to interact and exchange ideas. With the adoption of the 2030 Agenda for Sustainable Development and the 17 SDGs, the international community created a comprehensive and indivisible set of goals attaching equal importance to environmental, social, and economic concerns. This acknowledges for the first time that transformation to sustainable and resilient societies cannot happen with a “business as usual”, siloed, approach, and that a systems approach is a necessary condition for successful transformation. Translating this awareness into policymaking processes, however, remains a challenge. A full understanding of the interconnected reality of the SDGs remains elusive, and practitioners are seeking robust tools and guidance that can increase awareness and understanding that will eventually make integrated and coherent policymaking common practice. To meet the challenge, a number of tools were developed to support policymakers and other actors in society in designing, implementing, and supporting coherent and integrated policies in pursuit of these goals and targets, and to consider transboundary and intergenerational impacts. One such tool is a social simulation game called The World’s Future: A Sustainable Development Goals Game. The game was developed during the Systems Analysis Forum (SAF) exploratory project, “Systems Thinking for Transformation”, that was led by the Ecosystem Services and Management Program (ESM), in collaboration with the Risk and Resilience Program and the Centre for System Solutions. This serious role-play game is based on scientific systems research, and functions as an experiential training and learning playground. The game challenges participants’ understanding of sustainability dynamics and their ability to innovate and collaborate towards the global goals. Specifically, it aims to help players deepen their understanding of the complexities of the global system. This includes identifying and acknowledging the interdependency of actions in pursuit of the goals across policies, regions, and time; better understanding synergies, trade-offs, and feedbacks, as pursuing some goals and targets might undermine the achievement of others; as well as the ability to reflect on negotiation patterns, effective communication, and collaboration. The OECD gaming session took place in June 2017 and was organized with the unit for Policy Coherence for Sustainable Development. 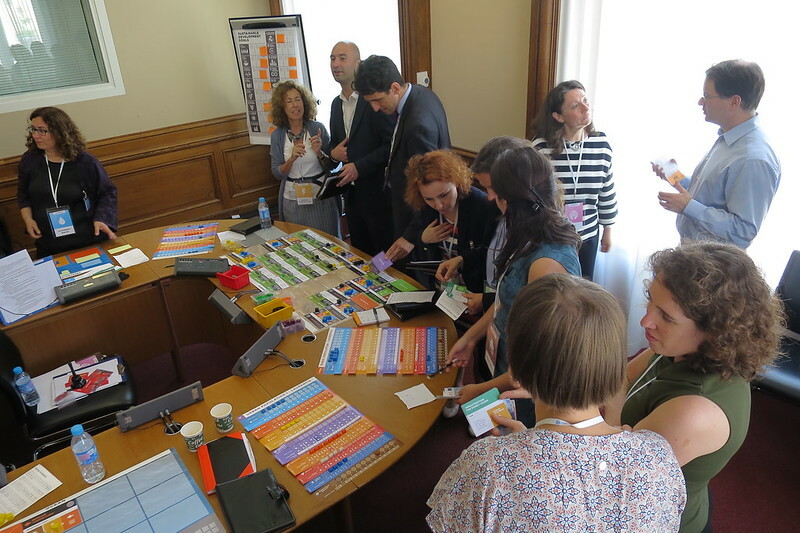 The game prototype was played with an interested group of OECD sectoral experts and Focal Points from OECD member states, who also helped test and further improve the game through their feedback. At the European Commission, two game sessions were organized with the Directorate-General for International Cooperation and Development’s Policy and Coherence unit (DG DEVCO A1)–one session for the unit itself, and one session for staff from other DGs. Both sessions took place in Brussels in October 2017. The World’s Future game was very well received by both institutions, and participants agreed that it was a realistic representation of real world situations and challenges. Although many real-world complexities are expressed in the game, it is important to note that the game is not based on any specific national situation. This means that participants will not necessarily be able to draw direct policy conclusions from the game. However, as a capacity building exercise, players can gain multiple insights to clarify, inspire, and offer guidance in terms of policy decisions in their real-life contexts. In addition to the sessions held at the European Commission and the OECD, many other groups across Europe, including some at the European Forum Alpbach, the National Youth Agency Austria, and the ScienceCenter-Network Austria, also played The World’s Future game in 2017.